At some point, we’ve all been caught off guard by an annoying ad online—like a video automatically playing at full volume, or a pop-up standing in the way to the one thing we’re trying to find. Thanks to research conducted by the Coalition for Better Ads, we now know which ad experiences rank lowest among consumers and are most likely to drive people to install ad blockers. Ads, good and bad, help fund the open web. 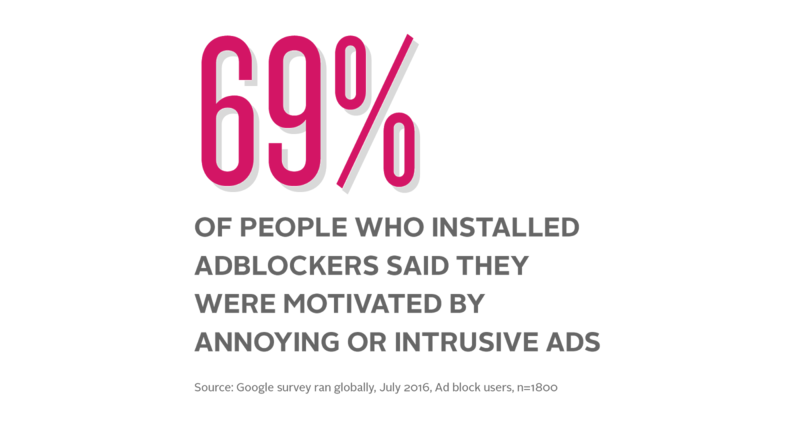 But 69% of people who installed ad blockers said they were motivated by annoying or intrusive ads. When ads are blocked, publishers don’t make money. In June we launched the Ad Experience Report to help publishers understand if their site has ads that violate the Coalition’s Better Ads Standards. In just two months, 140,000 publishers worldwide have viewed the report. We're already starting to see data trends that can give publishers insights into the most common offending ads. Here's a look at what we know so far. Pop-up ads are the most common annoying ads found on publisher sites. 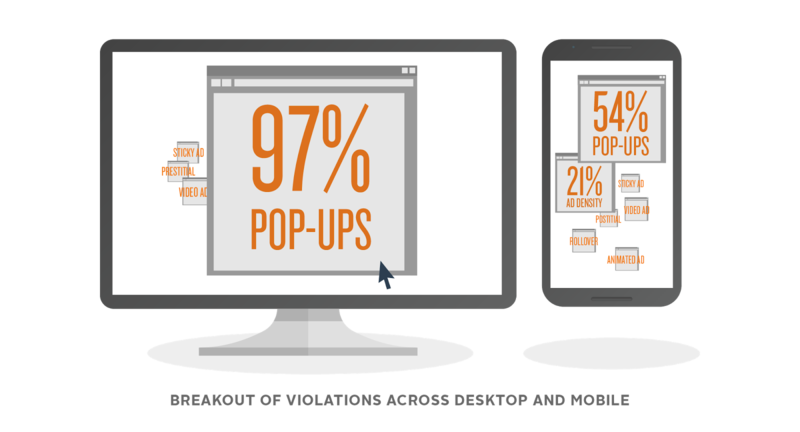 On desktop they account for 97% of the violations! 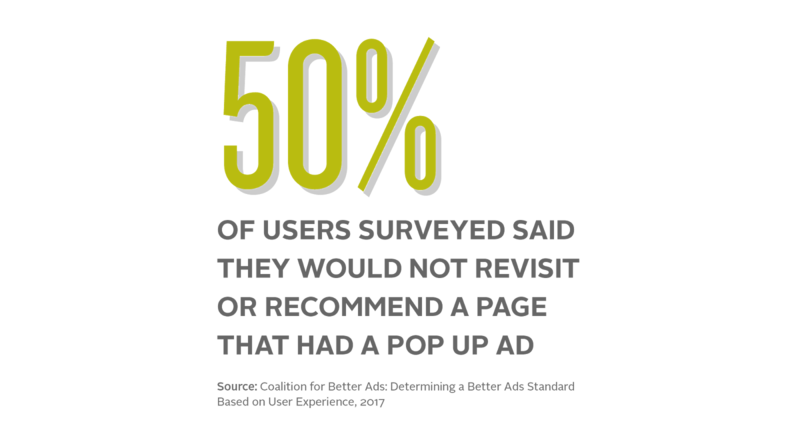 These experiences can be bad for business: 50% of users surveyed say they would not revisit or recommend a page that had a pop-up ad. Instead of pop-ups, publishers can use less disruptive alternatives like full-screen inline ads. They offer the same amount of screen real estate as pop-ups—without covering up any content. Publishers can find more tips and alternatives in our best practices guide. On mobile the issues are more varied. Pop-ups account for 54% of issues found, while 21% of issues are due to high ad density: A mobile page flooded with ads takes longer to load, and this makes it harder for people to find what they're looking for. Our early reporting shows that most issues are not coming from mainstream publishers, like daily newspapers or business publications. They come from smaller sites, who often don’t have the same access to quality control resources as larger publishers. To help these publishers improve their ads experiences, we review sites daily and record videos of the ad experiences that have been found non-compliant with the Better Ads Standards. If a site is in a “failing” or “warning” state, their Ad Experience Report will include these visuals, along with information about the Better Ad Standards and how the issues may impact their site. We encourage all publishers to take a look at their report. Here’s how. The Ad Experience Report is part of Google Search Console, which means you need to be a verified site owner to access it. You can either ask your webmaster to add you as an owner or user, or verify ownership yourself. Learn more. If your site has been reviewed and the status is “Warning" or "Failing," the report will show videos of the ad experiences that are likely to annoy or mislead your visitors. Click on desktop or mobile reports to see the specific experiences identified. Once you’ve identified the violating experiences, work with your ad ops and site design teams to remove the annoying experiences. After that, describe how you addressed each of the issues in the ‘Request review’ area and click ‘I fixed this’. You’ll receive a confirmation email saying your review is in progress. Learn more. Over the next few weeks we’ll begin notifying sites with issues. For even more insights on the types of sites and violations found, publishers can visit The Ad Experience Report API. The good news is that people don’t hate all ads—just annoying ones. Replacing annoying ads with more acceptable ones will help ensure all content creators, big and small, can continue to sustain their work with online advertising. This is why we support the Coalition’s efforts to develop marketplace guidelines for supporting the Better Ads Standards and will continue working with them on the standards as they evolve.